Apple Watch Vs. iWatch: Does The Name Matter? Everyone expected Apple Inc. (NASDAQ: AAPL) to add another familiar lowercase "i" to its smartwatch branding, but the company went in another direction. Unlike the iMac, iPod, iPhone and iPad, the newest Apple product will lead with the company name. This is an interesting turn of events for the tech giant. Was it a necessary transition, or should the Apple Watch have been known as the iWatch? "It's always been ingrained in everyone's head: iPod, iPhone, iPad," Niles Lawrence, president of stock analysis site Vuru, told Benzinga. "Everything had that 'i' thing to it. But I guess actually having the Apple [name] in front of it could make it a bigger global brand. Maybe people across the world haven't heard of Apple yet or iPads or whatever, which I really doubt at this point. But having the name 'Apple' in front of Apple Watch makes it, 'Oh, that's an Apple watch,' to people who didn't know that before hand." Lawrence referred to Apple's naming decision as an "inspirational" choice. "They're re-doing their brand to make it more focused on the company," he said. "You resonate the 'I' with [Apple]. But by doing Apple Watch, this is a device where you know [immediately know the manufacturer] and it goes from there. And it has kind of a premium feel to it." Apple is indeed hoping to attract the premium market with its new smartwatch. The company plans to employ jewelry store security protocols to protect the 18-karat gold edition from thieves. Lawrence thinks that Apple will be the first company to help smartwatches enter the mainstream market. "I've always thought that Apple is a very B2C company," he said. 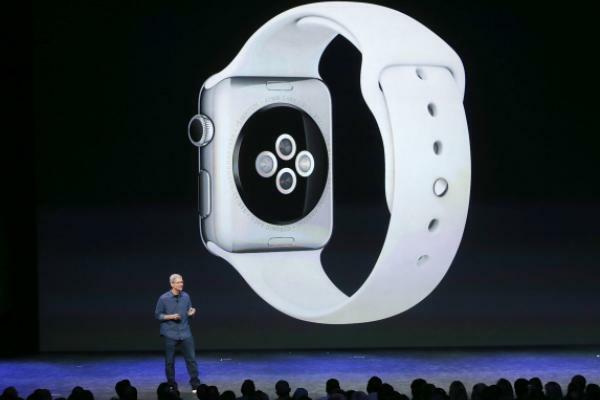 "By releasing a product like Apple Watch, I think it will throw wearables into the scene. People will start taking wearables more seriously. Right now what you're seeing with a lot of wearables is that it's kind of a fan project. The early adopters that are getting into it, you're seeing them at hackathons and hack events, but you're not really noticing what the companies are doing until something like [the Apple Watch] comes out and really changes the perspective." Lawrence believes that the device's features and capabilities "will allow it to be a huge product for the company." "It also adds a new competitive advantage to Apple," he added. "It will place them in the spotlight for wearables. There things like Pebble, which is a great company. A lot of these companies are very early adopter-based. Once Apple comes into it, there's just a huge market for it."